You’d think 10 in the morning is too early to be craving a lobster cappuccino with salted croissant but I’m here to tell you that you’re wrong. The most delectable food images were waiting for me in my inbox this morning and I can’t help but salivate at the InterContinental Grand Stanford Seafood Splendor promotion. Visit The Mistral to sample Chef Claudio’s homemade pasta and be sure to try out the homemade saffron tagliolini pasta with prawns and green asparagus or homemade green lasagna sheets with seafood in a sauce of anchovies. 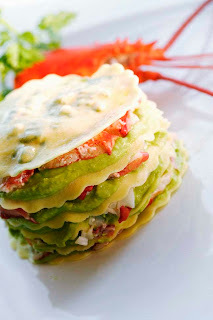 Also on offer, delicate Steamed Boston lobster with tomatoes, onions, melon in lime dressing and tuna carpaccio with a crust of Sicilian Olives and salad of sweet crispy apples and celery. And of course there’s that Lobster cappuccino with salted croissant. Grilled scallops, king prawns and tuna served with saffron and crab risotto marks its return to this month’s menu, with the additional fillet cod with a light herb topping and spinach, served with a sweet red peppers sauce as main course options. For reservations, please call +852 2731 2870.